Are you fresh out of glass slippers and pumpkin carriages? Is your evil stepmother getting on your nerves? Maybe your Fairy Godmother is busy or overbooked or just not providing the level of service you expect from a Fairy Godmother. 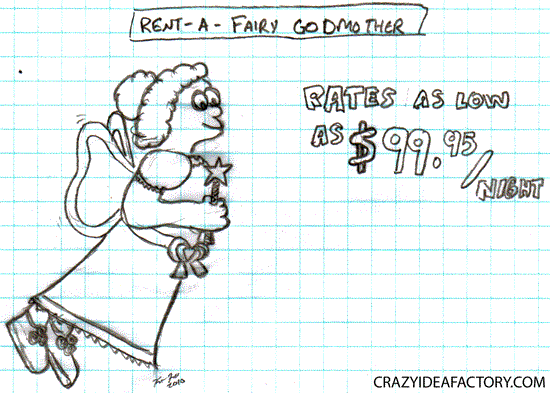 Welcome to Rent-a-Fairy Godmother where you can rent best in class Fairy Godmothers for as little as $99.95 a night. So the next time your wicked stepsister is attempting to move in on your prince charming don’t leave your fate up to birds, mice and an your unreliable Fairy Godmother. Call Rent-a-Fairy Godmother to schedule your appointment today. Operators are standing by. What is the easiest way for governments to create more money? Why, to print more of it of course. We as citizens should also be able to print our own money on demand. Here is my contribution to the print your own money trend. If you print it on something valuable, it may actually have value. Or it might just eliminate the value of what it is printed on. Either way it is so much cooler than Monopoly money. 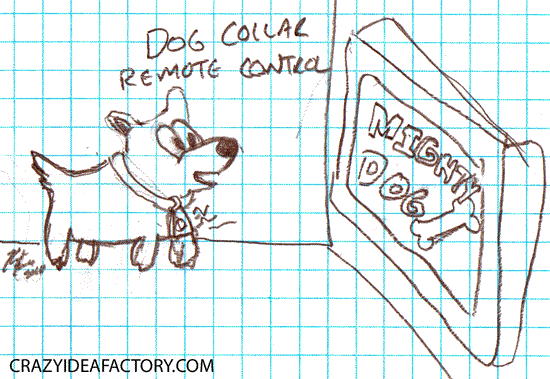 Now we need to develop a way for dogs to use the computer so they can visit crazyideafactory.com. Do you love to chew your fingernails, but the bad flavor turns you off? 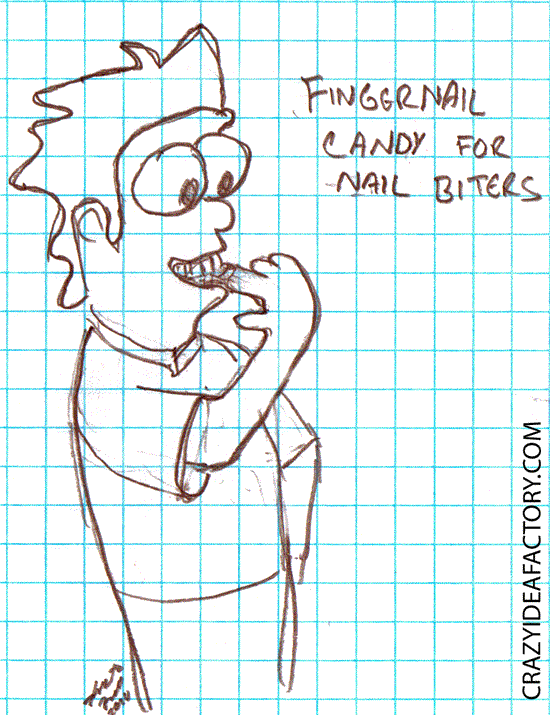 Solve that problem with flavored fingernail candy. Stick one of these candy-fingernails to your fingernail and you can chew all day and not have to worry about how bad your nails taste. They also add a little extra nail for you to chew if you have already chewed your nails down all of the way. Do you ever long for the sweet sound you can only hear from a real set of bagpipes, but you don’t know anyone with the skills to play them? 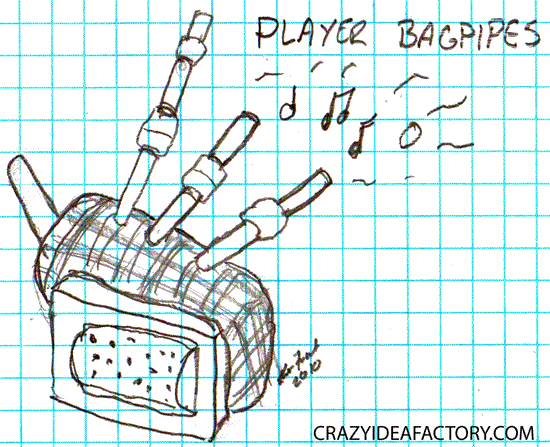 If so you should invest in a set of player bagpipes. Just like a player piano, turn on the player bagpipes and they will fill your home or fine establishment with wonderful bagpipe music. Is having money or credit cards available in your wallet or purse too big of a temptation, you may need the Wallet Lockdown. 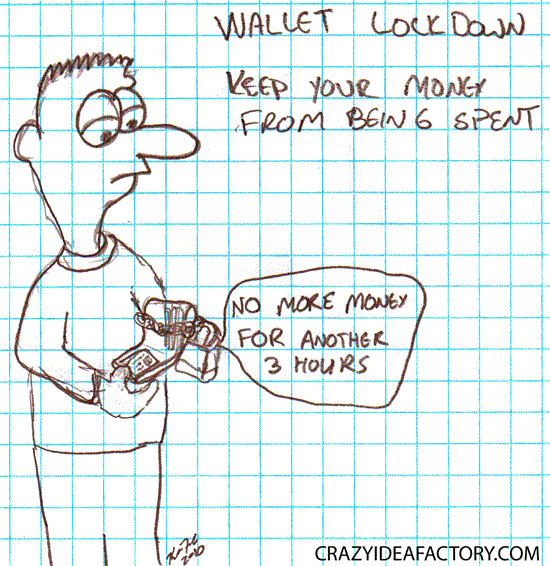 The Wallet Lockdown will not allow you to spend money faster or in larger quantities than your preset intervals. It may just be the help you need to avoid impulse buys at retail stores and it will force you to stick to the value menu when eating out. 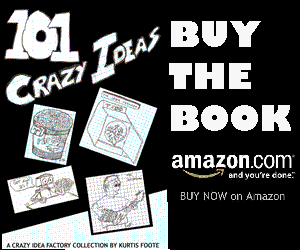 This crazy idea is inspired by the Illustration Friday word of the week, spent. Air bags are the part of your car that helps protect you right? 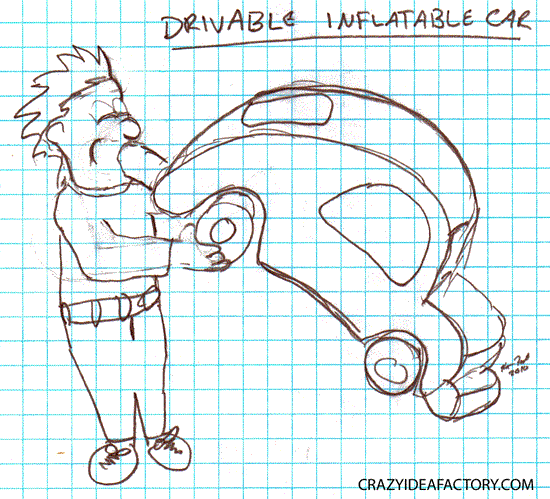 Well, wouldn’t it be safer if your entire car was an airbag? Inflatable cars are the wave of the future, safe, lightweight and the work well with the rest of your inflatable furniture. Crackers exist, peanut butter exists, cheese in a can exists; why doesn’t peanut butter in a can exist? This is the question troubling my dear friend Sandy. There are crackers of all shapes, sizes and flavors, but the are all missing one critical thing; peanut butter in a can. Write to your local peanut butter representatives and let them know you want to solve this problem plaguing our nations crackers. Let them know you want to see peanut butter in a can on a store shelf near you! I love eating popcorn, but every time I eat popcorn I end up with more popcorn stuck between my teeth than I have in my stomach. 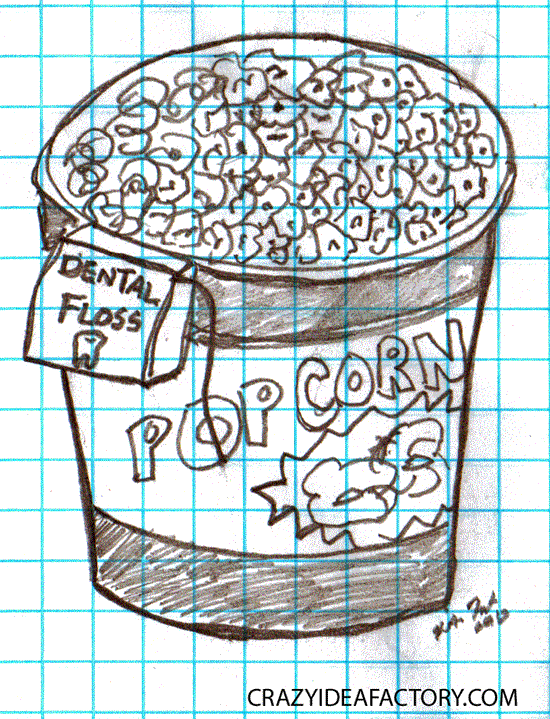 A roll of dental floss attached to the side of the popcorn tub would be helpful addition. After eating the popcorn I could floss my teeth without having to leave the couch during the best part of the movie. It could also be a good promotional tool for dentists. The whiteboards are filled with equations and random writings, our contestants have erasers in hand. 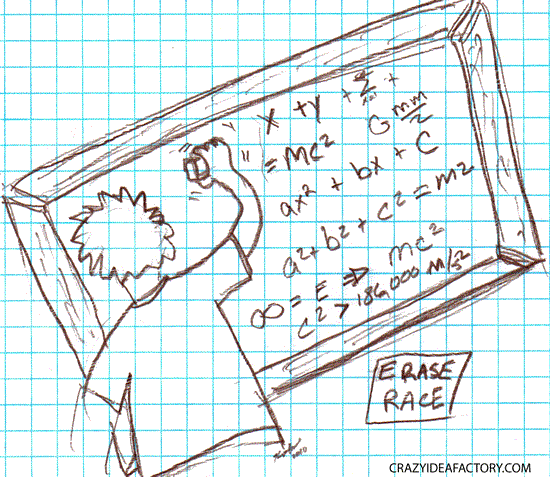 Erase racers on your marks, ready, set, erase! The class watches in awe as Lenny the fastest eraser in middle school returns the whiteboard to clean and pristine condition. But, wait, can it be? Fritzelma has erased her board first and has become the new world champion eraser! Fritzelma you are the new world champion eraser, what do you plan to do next? This crazy idea is inspired by the Illustration Friday word of the week, racing.